Millions More for a Failed Anti-Drug Propaganda Campaign? Ridiculous! Opinion: Peter Schrag: Can we end Harry Anslinger's costly legacy? Via DrugWarRant, John Walters had a tough time answering questions from the Dallas Morning News. Pete Guither already covered this effectively, but I can’t resist. Q: It's interesting that you emphasize a public health approach, because there's a perception in the academic community that studies drug policy that there's too much emphasis on interdiction and not enough on treatment. A: The academic community that works on drug policy is almost uniformly second rate. They're fighting battles over dogma that doesn't really exist anymore, that's in the past. Walters is right, but for the wrong reason. As Pete analogizes perfectly, it's "the equivalent of an "F" student accusing a "C" student of being dumb." After all, if Walters was even familiar with or remotely capable of refuting these accusations, he'd have attempted to do so rather than categorically dismissing the notion that academics have anything to contribute to the discussion of drug policy. Q: What about drugs coming out of South America, mostly heroin and cocaine? Figures from your office show a decrease in supply and purity, but other studies contradict that. Illegal drugs remain cheap and widely available. A: I certainly recognize that there are particular places in the United States that won't see the same performance as the aggregate. That's true of education performance and crime and consumer prices. We're a big country, and there are variations. But we have seen declines, through a combination of eradication of both poppy and coca, and record seizures. Hilariously, the Dallas Morning News links this story on the failure of cocaine eradication right next to his deliberately confusing (and utterly false) explanation. Pete Guither suggests that Walters isn’t trying as hard anymore, which is interesting to consider. These are weak answers from Walters and the rest of the interview isn’t much smarter. Particularly to accuse the academic community of incompetence before launching into a comically unscientific discussion of "regional variations" is tragically ironic. Still, this strikes me as the sort of incoherence that only a reasonably intelligent person can produce. Ultimately, the problem with Walters isn't that he doesn't try. It's that he's a flagrant liar who experiments with various ways of saying things that aren’t true. I'd like to think that Walters is trying as hard as he can and that the reason he sounds exhausted is because he's running out of material. There is probably not a single drug reformer alive who, at some point, has not sputtered into his coffee cup upon hearing some inane pronouncement from drug czar John Walters. We know what he is saying is wrong and unjustifiable. Sometimes we even go to the effort of thoroughly debunking one of his outrageous claims. It's not that hard to do, really, but up until now, no one had thoroughly deconstructed the claims made by the Office of National Drug Control Strategy (ONDCP, the drug czar's office), testing them against the norms of science and reason. That has changed with the recent publication of "Lies, Damned Lies, and Drug War Statistics," by Appalachian State University Associate Professor of Criminal Justice Matthew Robinson and Associate Professor of Political Science Renee Scherlen. Since the annual National Drug Control Strategy reports put out by ONDCP form the basis for crafting federal drug policy, this pair of professors decided to systematically put to the test the claims made by ONDCP as a foundation for those policies. Every federal bureaucracy has to justify its budget, and it does so by setting goals and demonstrating how well it has or has not met those goals. But, as Robinson and Scherlen so admirably demonstrate with example after example of the misleading use of statistics and visual graphics, ONDCP is, in many, many ways, distorting reality to paint a rosier picture of its "successes" in waging the war on drugs. They do so in a calm, deliberate, and understated manner rather than engaging in a partisan attack on a set of policies they clearly feel are a disaster. In order to gauge the accuracy of ONDCP pronouncements, the authors look at three broad sets of claims made by ONDCP: Claims of success in reducing drug use, claims of success in "healing" America's drug users, and claims of success in disrupting drug markets. Robinson and Scherlen examine the annual National Drug Strategy reports beginning in 2000 and extending through 2005 to look at what ONDCP says it is accomplishing in these three broad areas. These three categories describe what it is ONDCP is supposed to be achieving, but, as the authors so comprehensively illustrate, ONDCP is all too ready to resort to deceptive and misleading information. Let's take claims of success in reducing drug use, for instance. In the 2001 National Drug Strategy, ONDCP produces a chart that shows a dramatic downward trend in teen drug use in the mid-1980s before remaining essentially stable throughout the 1990s. But since ONDCP and its mandate didn't exist before 1988, the chart is misleading. What it really shows is that throughout ONDCP's tenure, it has failed in its stated goal of reducing teen drug use. 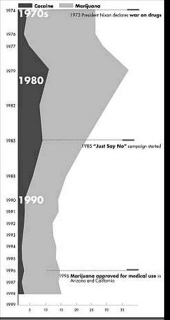 Similarly, in the 2003 National Drug Strategy, in an effort to justify its prevention campaigns, ONDCP sought to show that Nancy Reagan's "Just Say No" campaign was effective in reducing teen drug use. But to do so, ONDCP relied solely on data involving 18-to-25-year-olds. Since the "Just Say No" campaign was aimed at kids, using data about young adults is "a selective and inappropriate use of statistics," as Robinson and Scherlen so gently put it. ONCDP also has the curious habit of mentioning "successes" in one year, but failing to revisit them in following years when the numbers don't back them up. In 2000 and 2001, for example, ONDCP crowed about declining marijuana use, even though national drug surveys failed to back it up except in selective categories. But in the annual reports from 2002 to 2005, with marijuana use remaining steady, ONDCP doesn't make any specific claims regarding rates of marijuana use, nor does it provide easily accessible charts or figures. As Robinson and Scherlen note, "Indeed, it appears ONDCP ignores statistics that point to outcomes counter to the drug war." Robinson and Scherlen go on to systematically dissect ONDCP claims about reducing drug use, "healing" drug users, and disrupting drug markets. Sometimes, they even find that the claims are justified, but this is rarely the case. What the authors repeatedly demonstrate is that ONDCP is unable or unwilling to accurately report its failures to achieve its goals and is willing and able to resort to statistical chicanery to cover up those failures. In the final two chapters of the book, Robinson and Scherlen attempt a fair assessment of the drug war and ONDCP's ability to meet its self-imposed drug war goals, and offer a series of recommendations for what a more rational drug policy might look like. For one thing, the authors suggest, ONDCP ought to be either terminated or removed from the White House. For an accurate rendition of the numbers regarding drug use, they must be removed from the hothouse political atmosphere of the White House. Currently, the authors argue, ONDCP acts as a "generator and defender of a given ideology in the drug war." "Lies, Damned Lies, and Drug War Statistics" is surprisingly easy to read, and Robinson and Scherlen have done a huge favor not only to critics of current drug policy by compiling this damning critique of ONDCP claims, but also to anyone interested in how data is compiled, presented, and misused by bureaucrats attempting to guard their domains. It should be required reading for members of Congress, though, sadly, that is unlikely to happen.